A full-frame camcorder for roughly 3 grand? 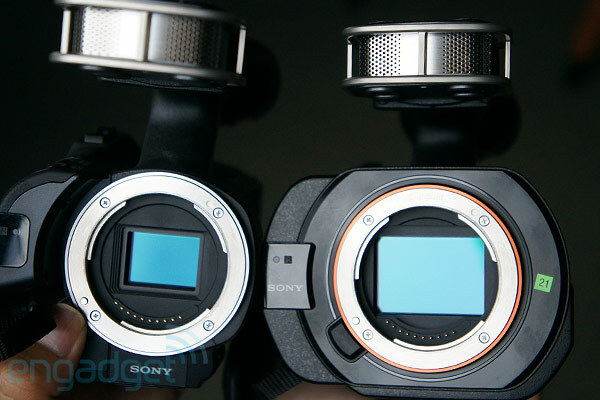 Meet the Sony NEX-VG900 Handycam -- the company's first 35mm HD video camera. Taking cues from its Alpha A99, which was just announced today, Sony brought that camera's 24.3-megapixel full-frame sensor to a camcorder form factor, delivering shallow depth-of-field and much improved low-light sensitivity in a more practical package. The VG900 is compatible with E-mount lenses, and it's a fine stills shooter (like the A99, it's capable of 14-bit RAW captures), but it's best suited for high-end video production, where it offers 1080p recording at 24 or 60 frames-per-second through a sensor that features 45 times the area of a conventional camcorder. This model even adds some of Sony's picture effects from the stills line, such as soft focus and miniature mode, while certain filters, like partial color and high-contrast monochrome can even be added to video. Also on order for today is the NEX-VG30 -- the successor to the VG20 -- which offers many of the same features, but with a 16.1-megapixel APS-C CMOS sensor instead. If you're looking for a capable Handycam and don't want to spring for full-frame, this is your match. Both models include 270-degree swivel 921k-dot touch-enabled TruBlack LCDs and XGA OLED eye-level electronic viewfinders, along with Sony's new Multi Interface Shoe, which enables XLR microphone inputs through an optional accessory. The Handycams offer a new zoom seesaw level with multiple speeds for smooth, silent lens adjustments. There's also digital zoom functionality, which is likely to be more appropriate for the VG900, since that model's full-frame sensor has the pixels to spare. That flavor is quite costly, coming in at $3,299 without a lens, though an LA-EA3 mount adapter is included so you can attach full-frame-capable A-mount lenses. The VG30, for its part, will retail for $1,800 body only, or $2,700 when paired with Sony's new 18-200mm f/3.5-5.6 OSS power zoom lens -- a $300 savings, considering that optic's $1,200 standalone price tag. The VG900 is slated to ship beginning in late October, while the VG30 will hit stores in November, but you can take a closer look right now in our hands-on gallery below.